Colin Farrell | No Chic. Just Geek. Perhaps I should make clear that the people I was earwigging in 1994 were both youngish men, while my companions for the new version of The Beguiled were somewhat older ladies. Does this tell us anything about the differences between the 1971 version of the movie, directed by Don Siegel, and the remake? Well, perhaps. 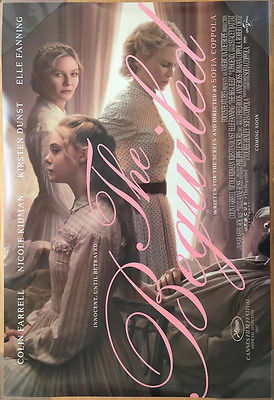 Like the original, Sofia Coppola’s movie is set during the latter stages of the American Civil War, in and around a finishing school for girls in Virginia. Due to the turmoil of the conflict, only a tiny group of pupils remain, along with a couple of staff members – headmistress Martha (Nicole Kidman) and teacher Edwina Morrow (Kirsten Dunst). One day, one of the girls is out picking mushrooms in the woods near the school when she comes across John McBurney (Colin Farrell), a wounded enemy soldier. She helps him back to the grand old house in which the establishment is located, at which point the question becomes one of what they should do with him. Obviously, the sensible thing to do would be to call in the authorities of their own side straight away, but somehow it doesn’t seem quite so simple – McBurney would probably die on the way to a prison camp, so the charitable thing is surely to keep him around until he feels better, isn’t it? There is, not to put too fine a point on it, a little unrelieved tension in the air, as the presence of McBurney has an alarming effect on a group of women and girls who have apparently been living without masculine company for far too long. McBurney’s own natural charm and manipulative nature don’t help matters much. The women are soon all under his spell, and he seems to be on to a very good thing at the school. But has he underestimated the strength of the emotions his arrival has unleashed? Being a hate-filled fanatically misogynistic crypto-fascist (apparently), I am constantly surprised by the fact that I frequently admire and enjoy films directed by and starring women, but there you go. I did not catch Sofia Coppola’s last couple of films, but I did see Lost in Translation and Marie Antoinette, and had a pretty good time watching them both (even if my review of the latter does contain the suggestion ‘would have been much improved by the addition of a story and some decent dialogue’). The Beguiled is likewise not a film which anyone is likely to decry as an offence against cinema, but at the same time I can’t see it becoming as big a critical darling as some of this director’s films. I mean, the actual carpentry of the story holds together pretty well, though it would possibly have been better if we’d got more of a sense of what life in the school was like prior to McBurney’s arrival. Creating atmosphere is one of Coppola’s strengths as a director and she duly creates a strong sense of unspoken tension between the various women as they slowly begin to compete for McBurney’s favours. The performances are universally strong, although everyone seems to be operating very much within their comfort zone as a performer. I’m sure I’ve seen Nicole Kidman do that mannered southern lady schtick before, and the same is true of Kirsten Dunst’s repressed schoolteacher. Elle Fanning perhaps does something slightly new as a somewhat out-of-control young girl. On the whole this is the kind of film you would expect it to be – atmospheric, fairly intense, and not especially light on its feet. Then again, perhaps I’m biased, for I have seen the original Don Siegel movie on which the new one is based (although admittedly not recently). The 1971 Beguiled always seemed to me to be very much framed and marketed as a Western, although that may just be down to the presence of Eastwood and Siegel. The new movie is much more open about its identity as a drama (perhaps even a melodrama) in the Southern Gothic tradition, though perhaps this is also the result of the story being seen from a more openly feminine perspective. I would imagine you are more likely to enjoy watching the new version of The Beguiled if you are not familiar with the one starring Eastwood, simply because the plot will contain a few surprises for you. This is a well-mounted, well-played, capably-directed movie, but it doesn’t really add that much to an original which was a memorably unsettling and quietly powerful psycho-drama in its own right. A moderately engaging piece of entertainment, I think: not much more than that. I hate to break it to you, but we are currently approximately 16% of the way through the 21st century. All resources must be exploited. All revenue streams must be maximised. The chances of anything still popular and therefore financially viable being allowed to remain a fond memory are, to be perfectly honest, zero. So it should come as no surprise that it has been decreed that the vastly lucrative entity that was the Harry Potter film series has lain fallow long enough, and that a series of prequel movies has duly started to appear. (It took about fifteen years for the original Star Wars trilogy to get prequelated; ten years for The Lord of the Rings; with Harry Potter the delay is down to five. At this rate the prequels will soon start coming out in double bills with the films they are based on.) First out of the blocks to hoover your money is Fantastic Beasts and Where to Find Them, directed by David ‘Safe Pair of Hands’ Yates. All righty then: the story opens with the arrival in New York, New York of Newt Scamander (Eddie Redmayne). He is a traveller who appears to be British, has floppy hair, is terribly eccentric yet clearly meant to be hugely endearing, wears a bow tie, and has a battered old box which is bigger on the inside than the outside (hey, I’m just saying). Newt is, of course, a wizard, for we are in the Wizarding World of Harry Potter (TM), although we are also in 1926 on this occasion. Inside Newt’s magic box are his collection of magic animals, a.k.a. weird little chunks of CGI, which he frequently fishes out and bonds with; so often, in fact, that you begin to fear for Redmayne’s sanity after all that acting to empty air and golf-balls on sticks. His visit to the States runs into trouble when he accidentally mixes up his case with that of aspiring baker and non-magician Jacob Kowalski (Dan Fogler) and several of the little buggers inevitably escape. This draws the attention of magical cop Tina Goldstein (Katherine Waterston) and her kooky sister (Alison Sudol). The magical authorities of the States are not best pleased as it seems that some kind of supernatural menace is already on the loose in the Empire City, preying on normal people and wizards alike, with top wizard-cop Colin Farrell on the case. Can Newt and his friends recapture all his lumps of CGI and solve the mystery of what’s really going on? The ardour of the Harry Potter fanbase is still such that a film like Fantastic Beasts is effectively critic-proof; and sure enough this one has made over $270 million in about a week of release. Anyway, it would be remiss of me to say that it is an actual waste of time, money, and talent, for clearly a lot of thought, imagination and skill has gone into creating the world and story of the film. Even so, one can’t help but notice that this first made-directly-for-the-screen tale has ditched the British setting for something more familiar to that big audience in the USA (i.e, a setting in the USA). It hasn’t become totally Americanised, but something very odd still seems to have happened: this is a film with a main character who resembles an American person’s idea of what the British are like, set in a place which is a British person’s idea of what America is like. Then again, it’s JK Rowling, so you don’t turn up expecting reality, and the two things do kind of balance each other out. That said, I’m rather less impressed with Rowling the screenwriter than I was with Rowling the novelist: the story is reasonably well-structured, and properly cinematic in scope, but the plotting is considerably less impressive, the tendency towards sentimentality seems rather stronger, and as usual the thing is in dire need of a good no-nonsense editor. Possibly the most serious problem, which may become more obvious as this series goes on – apparently four (four?!?) more prequels are in the works – is that very sense of self-indulgence, of the film being its own raison d’etre. I still think much of the success of the Harry Potter books was down to their comforting familiarity to parents rather than children: there’s a touch of Agatha Christie to that fiendishly clever plotting, and also of Enid Blyton in the Three Have A Wizard Time vibe which is so often in evidence. Underneath all the intricate world-building they are on some level pastiches of different kinds of story. Fantastic Beasts, on the other hand, is just a fantasy with a couple of right-on subtexts of brick-through-your-window subtlety, coupled to a lot more world-building. Some of this is interestingly unexpected: the magical community in the USA, despite having a female president (told you it was a fantasy), is by no means depicted entirely flatteringly – they are autocratic and alarmingly fond of the death penalty. 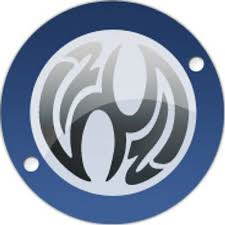 But much of the rest of it may not be that interesting to you if you’re not already a pretty heavy-duty Harry Potter fan, and many of the references to characters and so on from the previous films and books may likewise go over your head if you’re not one of the faithful. Due to my abnormally retentive mind, I think I got most of the references, but even so I thought much of the climax was rather underwhelming – there didn’t seem to me to be a lot at stake, at least nothing I’d been made to care about. Some concluding revelations in particular are most likely to simply baffle people who maybe saw all the earlier films once each when they came out, and can’t remember all the labyrinthine backstory of every major character. Still, it looks suitably lavish and there are some nice performances: Redmayne is a bit too mannered for my tastes, but Fogler gives a charming performance, Farrell gives proceedings some heft, and they appear to have finally run out of new ways to smother Ron Perlman in latex rubber: he appears here via mo-capping, as a goblin who seems to be in desperate need of a chiropractor. None of it is actively bad, although Sudol’s performance possibly comes close in terms of sheer capacity to annoy, and I have no doubt the expectant masses will lap it up like butterbeer. 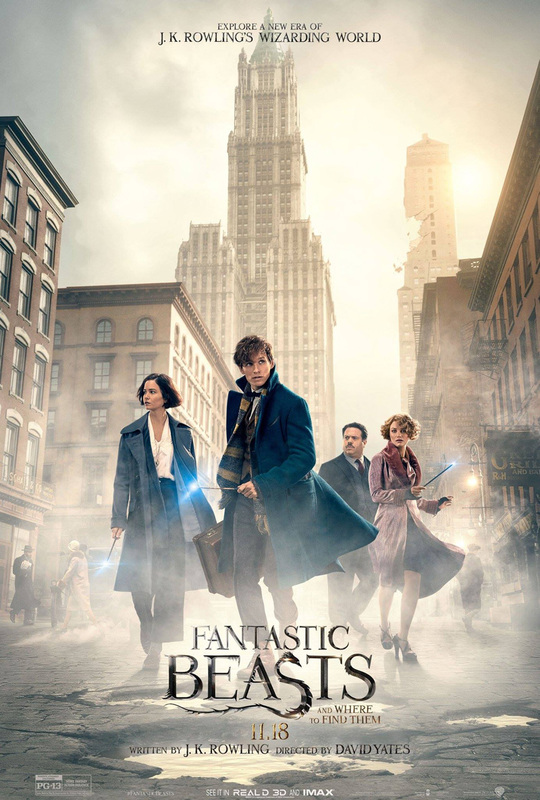 Fantastic Beasts is, though, primarily a film which has been made to service an existing fanbase, and just how much you enjoy it will probably depend on how much of a true believer you are. I was never really one of the faithful, certainly as far the movies go, and so I found this film to be a reasonable diversion, perhaps rather overlong and a bit schmaltzy, but generally inoffensive overall. It will be interesting to see how well this film does over the whole length of its release, and whether subsequent instalments will direct themselves quite so exclusively at the core audience. And if it sounds to you that I’m treating this film more as an exercise in branding and marketing than an actual piece of storytelling – well, I commend you on your perspicacity. But it is 2016, after all. Every now and then a movie comes along which really makes you pause and scratch your head, not necessarily because it’s bad, but because it’s just so utterly unlike anything else on release. The same goes double when a movie of this kind manages to snag what looks very much like an A-list cast. Are they trying to show their credentials as serious artists? Is it perhaps some kind of situationist statement? Or does the director just have a fistful of incriminating photographs? David soon settles in and adapts to the kindly-yet-terrifying regime of the hotel manager (Olivia Colman), making friends with some of the other singles there (including John C Reilly and Ben Whishaw – this may not be the biggest hit Whishaw appears in this month). As well as being indoctrinated in all the various advantages that being in couple brings, on a regular basis all the inmates of the hotel are bussed down to the local woods, where they hunt and tranquilise ‘Loners’, people who have opted to defy the conventions of society. However, life at the hotel does not really work out for David, and he eventually becomes a Loner himself, managing to win the confidence of their leader (Lea Seydoux – this may not be the biggest hit Seydoux appears in this month). Ironically, of course, no sooner has he won his place in this most antisocial of societies than he finds romance blossoming between himself and one of the others (Rachel Weisz – this may not be the biggest hit a member of her household appears in this month). Will true love conquer all? Well, the question presupposes that the words ‘true love’ actually mean something. I suspect the makers of The Lobster wouldn’t necessarily agree with this, for this film has one of the dourest, most cynical views of relationships I can remember seeing. There is hardly a hint of genuine affection between any of the couples at the hotel – their relationships are not romantic but simply transactional, a necessity which is more-or-less forced upon them. No-one questions the necessity for being part of a couple, it’s just accepted as an essential part of living. 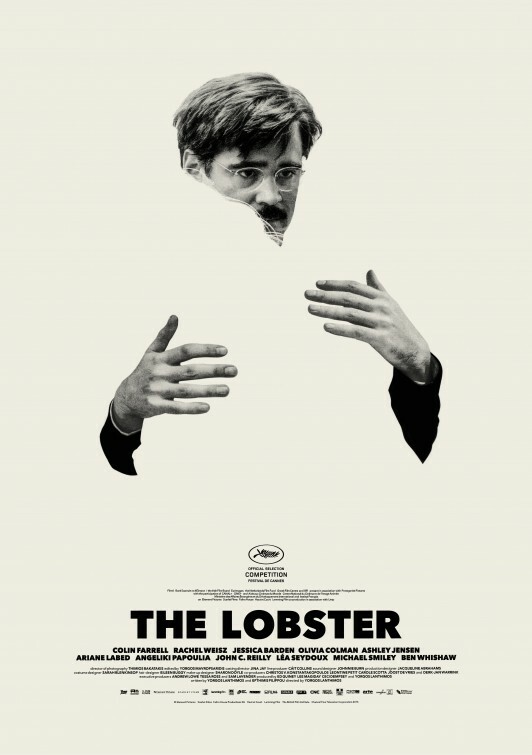 The Lobster is widely being dubbed a comedy in reviews and promotional material, and it may be that this doesn’t sound to you like particularly fertile ground for big laughs. I would tend to agree, and in fact I suspect the whole ‘comedy’ label has come from the fact that it isn’t obviously anything else, and the central idea of people being turned into animals is quite a silly one. On the whole the film defies the concept of genre, or at least refuses to be bound by it – there are some blackly comic moments, all of them utterly deadpan (Farrell trying to take his trousers off with one hand cuffed behind his back, for instance), but also a fair amount of graphic material, and sections bordering on the horrific (this isn’t a film for animal lovers, either). I can only presume that the big-name cast are doing this just to show that they are artists as well as stars. All of the performances are, well, game, with Farrell and Weisz in particular coming out with dialogue of the most affectless inanity with utter conviction (this is yet another of the film’s stylistic quirks). If they never quite manage to sell you on the idea that this film is set in a coherent other-world, well, that’s because it’s just too weird an idea to work in those terms. It’s not as if the metaphor underpinning The Lobster is exactly difficult to decipher, either: the film is an ironic comment on the importance society places on being part of a couple (and anyone who tells you this doesn’t make a difference has clearly never had to contend with the dreaded single supplement on a package holiday). This extends to an implicit criticism of the lengths that people will go to in order to establish or maintain a connection with someone, although once again this is grotesquely exaggerated in the film. Fair enough, there’s material for a film there, but The Lobster seems to run out of new ways of discussing it quite quickly. You get a strong sense of where the film is coming from quite quickly, but by the second half it’s starting to feel like they’ve run out of ideas and are just indulging themselves in arbitrary weirdness to pad out the film. This is certainly an original movie, well-made, and with some serious talent involved – and it does contain some funny moments and interesting ideas. But in the end, it does feel a little bit self-indulgent, and it’s often not the easiest of films to watch. Nice to see something quite so weird getting a relatively big release, but I suspect that has more to do with the cast list than anything else. If you were of a sour, baleful, Daily Mail-ish disposition, you might well find something very disagreeable in the current trend towards films which are essentially historical accounts not of the lives of great people, nor of the details of significant events, but simply of the making of other films. And I suppose you might have a point – at the very least it smacks of creative conservatism, if not an outright dearth of ideas. Already this year we have had Hitchcock, which was essentially behind-the-scenes on Psycho, while making a solid pitch for the quality-Christmas-non-Elf-fixated box office is John Lee Hancock’s Saving Mr. Banks, which is deeply concerned with the genesis of the movie version of Mary Poppins. Emma Thompson plays Mrs P.L. Travers, the author of the Mary Poppins stories. The main plot of the movie is set in the early 60s, by which point she has been fending off expressions of interest in the film rights to her work for decades. Now, however, bankruptcy looms, and rather than lose her home she is obliged to depart for California, to work on a script for a film with the creative guys at Walt Disney Productions. Walt Disney himself is played by Tom Hanks. Disney is genial, avuncular, folksy and charming – Mrs Travers is prickly, particular, formal and demanding (she thinks Disney’s life’s work is vulgar and frivolous). Both of them are used to getting their own way, and so a titanic, if fairly good-mannered, clash of wills is in prospect. Intercut with all this is another narrative concerning Mrs Travers’ own childhood in Australia five decades earlier. This focuses on her complex relationship with her father (played by Colin Farrell), an affectionate man, but also a somewhat irresponsible alcoholic. Inevitably it is this storyline which illuminates and to some extent explains the character of the adult Mrs Travers, though the manner in which this is handled is variable. Sometimes the film is quite subtle, at other points it is not – a scene with Mrs Travers objecting to Mr Banks (the father in the Poppins film) wearing a moustache is closely followed by one where we see Farrell explaining to his daughter why it is so important that he shaves. 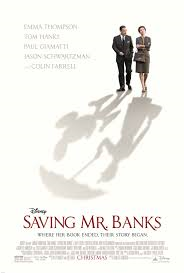 It seems to me that there are two main approaches you can take to Saving Mr. Banks, and your choice here will largely dictate your response to the film. Either it is a touching biographical excavation of an often-overlooked literary figure, or a ghastly piece of self-regarding publicity for the Disney corporation. Accusations that this film is basically a two-hour-plus promo for the Blu-ray of Mary Poppins, and indeed Disney enterprises in general, are not entirely without substance: the 1964 film informs the 2013 one to a considerable extent, to the point where excerpts from it are shown during the climax. Your enjoyment of most of the 1960s material will depend somewhat on your fondness for Mary Poppins – though I have to say that I’m indifferent to it at best, and still found these scenes to be enjoyable and frequently very funny indeed. Even the most sceptical viewer would, I think, concede that this is a very polished and charming production, with considerable credit due to the writers and cast. Watching Thompson and Hanks spar is a real pleasure – Thompson gets perhaps the slightly better part, but you can see Hanks is revelling in the opportunity to play such an iconic figure when it comes to both Americana and global pop culture generally. Paul Giamatti plays Mrs Travers’ chauffeur, and Brad Whitford, Jason Schwartzman and BJ Novak play Don DaGradi and the Sherman brothers: all of them get the tone of their performances pretty much exactly right. Colin Farrell gets the big role in the Australian sequences, but I was rather impressed by Ruth Wilson as Mrs Travers’ mother. I can’t help thinking that, based on what we’re shown here, the real Mrs Travers would have been mortified to the point of horror by the thought of her life story being repurposed as the basis for a heart-warming comedy drama, but I’m not sure that’s necessarily grounds for dismissing Saving Mr. Banks. I liked it a lot, and indeed I think it’s a film you would have to make a real effort to actively dislike – but, much as the central story of how the parent-child relationship can influence a person throughout their life is sensitively and impressively handled, one can’t shake the impression that this particular version of it is only being told due to its proximity to a much-loved, much-garlanded, out-now-on-various-formats movie classic. This is a good film, but the charge that on some level it’s basically just the Disney company patting itself on the back in public for two hours is going to be a hard one to dodge. The last ten years have seen the adoption by all the big studios of something called day-and-date releasing: this is the strategy whereby a new film gets released globally on pretty much the same day. It’s supposed to help combat movie piracy, but one of the fringe benefits is that the rest of the world gets to enjoy new blockbusters on the same day they come out in America, thus putting an end to the phenomenon of people timing their holidays in order to catch a particular film as early as possible. Day-and-date is still very much the norm for most big movies (although apparently Skyfall came out in the USA later than virtually anywhere else so as not to clash with the election), but for smaller offerings a degree of slippage in the schedule is not unknown. So it is with Martin McDonagh’s Seven Psychopaths. Back in October I got a message from an American friend making sure I was planning to see (and then, with grim inevitability, write about) this particular film. I wasn’t, at the time; indeed I’d never heard of it. I’d heard of McDonagh, not so much for his well-received films like In Bruges but because he was the brother of the director of The Guard, my favourite film of last year. But I’m a sucker for requests and the cast list for this film looked interesting, at least. Paying only the most cursory attention to the plot synopsis, off I went, anticipating a comedy-crime-thriller. Hmmmm. In the film, scripted by Irish writer Martin McDonagh, we meet an Irish writer called Marty (Colin Farrell), currently seemingly adrift in Los Angeles. He is struggling with his latest project, a script entitled Seven Psychopaths, mainly because he doesn’t have enough psychopaths and no ideas for what they’re going to do anyway. Real life around Marty is about to get somewhat psychopathic, anyway: a masked killer nicknamed the Jack of Diamonds is slaughtering his way through the LA mob, Marty’s strange best friend Billy (Sam Rockwell) is involved not only with the lovely girlfriend (Olga Kurylenko, very briefly appearing) of a nutso gang boss (Woody Harrelson), but also in a lucrative dog-napping business with the strangely devout, or should that be devoutly strange Hans (Christopher Walken, waaaaaaaaaaaaaaaaaaaaaaaaaaaaaaaaay out there even by his standards). Billy also wants to help Marty write the movie, and to help with the research has placed an advert inviting every psycho in California to get in touch with them and provide material for the script. Up turns Tom Waits, carrying both a live rabbit and a metaphorical torch. Meanwhile Marty is having second thoughts about the whole psychopath angle – is there no way he can do an action movie called Seven Pacifists instead? There’s a weary old saw about how some movies review themselves – this usually meaning that the film in question is self-evidently either good or bad: you can just write about what’s up on screen without having to think too much about expressing the finer points of its quality. Seven Psychopaths also has a go at reviewing itself, but in a slightly different way. This is because the script of the movie that Marty and Billy are writing bears an uncanny resemblence to the script of the movie they are actually appearing in – characters from the film start appearing, mixed up in the slightly awkward situation he, Billy and Hans find themselves in when Billy kidnaps the gang boss’s prized Shih Tzu. Most obviously, at one point Marty decides that their script will take a bizarre and uncharacteristic left turn – at which point his real life starts to follow exactly the same route. It sounds cringingly knowing and clever-clever, but this element appears so subtly and unexpectedly in what starts off as a gonzo LA comedy-drama that I was quite taken in by it. It makes it hard to shake the suspicion that when someone starts criticising Marty’s writing in the film, this is really Martin McDonagh owning up to a few flaws in his own script – most obviously, Marty is criticised for writing very few, and very small parts for women, most of whom are decorative and also meet untimely ends. Does this excuse the way Abbie Cornish, Olga Kurylenko and Linda Bright Clay are used (and sometimes abused) in this movie? Does saying ‘I know I’ve been bad’ excuse you for being bad? I’m not sure. Anyway, this layer of cleverness, added to the talent at work throughout the movie, results in something which is a huge amount of slightly guilty fun: very violent, profane, and more than a bit absurd. This is not to say that there are not serious and even quite moving moments along the way – there’s a very tense scene in which Walken’s sick wife is cornered by Harrelson, who’s out to get him but doesn’t realise who she is. This could have come out of a serious thriller. As the film goes on, though, it drops these occasional pretences and becomes much more about Sam Rockwell, who’s off the leash as a kind of demented idiot-savant who – not inappropriately – seems to have lost track of the boundary between reality and fiction. Rockwell is very funny and gives a very big performance, but then so is Harrelson, so is Walken. Colin Farrell is stuck in the middle playing the straight man and actually does a really good job of it. I haven’t seen a story crack itself open and start to play with its own guts in quite this way since Adaptation., and it may indeed be that Seven Psychopaths is not quite so accomplished, never quite escaping its slightly wearisome Tarantino-esque trappings. Certainly there are distinct signs of the film wanting to have its cake and eat it, particularly as the climax unfolds (‘unfolds’ is much too tidy and straightforward a word for it, of course). Seven Psychopaths is certainly satisfyingly clever and different, and – being totally wrong-footed by it to begin with – I enjoyed it immensely, for a while even wondering if the McDonagh family might be about to (figuratively) take home the (non-existent) film of the year prize for the second year in a row? I think not; while The Guard plays similar games with genre tropes to a lesser degree, it’s built around a genuine piece of characterisation with a proper supporting story. Seven Psychopaths just thrashes around demolishing itself and other Hollywood thrillers to hilarious effect – not that this is in any way not a worthwhile undertaking, nor one which is executed without skill, panache, and energy. Well worth watching.